I remember watching the introduction of a Seinfeld episode once where Jerry, in his usual stand-up mode, was explaining his theory on why people smoke. He made smoking sound like a craving sustained due to primitive, caveman mentalities. The line went something like, “People like to have smoke near their faces to show that they have power. ‘Look. I have fire. I am mighty.’” Up until this past fortnight, I’d always thought this was such a funny and possibly accurate observation … other than a little thing called nicotine addiction of course! I landed in the desert around Uluru two weeks ago after a six-week coastal holiday and drove to Alice the back way, stopping by Kings Canyon and Albert Namatjira’s little white house outside Hermansberg, then past Stanley Chasm, concluding with a tour of all the other places I’ve loved this past 23 years along that Western Macs side. Johnny Cash soothed the soul through the airways and hot, dry air flowed fast through the window, together making me feel like I was still a kid on a long road trip. If you’ve never been on that back road between the Canyon and Hermannsburg please, for your own sake, do. I’m fairly sure it has been rated amongst the top ten four-wheel drive tracks in Australia, although this would probably be for visual reasons as the road – other than some corrugation – is fairly light going. On either side of the track there is amazing shrubbery and the wide sloping hills caress in a valley that looks like it was made for a path to some secret land. Within a few hours of travel I noticed whirls of grey in the distance, what I thought were willy-willys. Slowly that burnt, husky odour met the nostrils and I realised those miniature windstorms were not comprised of dust at all, but fire. You can imagine the next bit of my story, I’m sure – the closer town became, the heavier the sky and I could feel a powerful pressure clutching my lungs. Pulling the car over to look at some blackened ground still fuming, I found the ghost of a tree lying across the sand. I’m referring to the powdery, ashen silhouette that is left when a tree totally burns out. The original wood is no longer there, but a shadow of itself lingers until either the wind blows it away, or it is eaten back into the earth. The closer we crept to the mouth of suburbia the more ghosts I saw and then all of a sudden they were no longer ghosts, but living trees still full of fire. You never think it’s going to be you in a situation like this. It’s surreal. When Black Saturday happened in Victoria, I’m sure the people assumed the best right until the very second that their properties and loved ones were engulfed. Luckily, it was not the case for me as you can tell because obviously I am sitting down here, writing this piece. But I was filled with the reality of this tenuous life. Nearing Simpson’s Gap, the car was forced to slow down as black smoke blew, clouding the way in a fog so thick the car in front could not be seen. I kept saying, “Nah, they haven’t closed the road. It must be fine!” It was strange sneaking through darkness in the middle of the day, but it was not until the inferno was blazing on the bitumen right along side the car’s wheels that I truly felt fear. It did not last long and perhaps there was no real threat … even though we did eventually see a police car racing past to shut the road! But this flash of fiery images I’ll never forget. What a way to get home. Now I’m trying to settle back in, but smoke keeps getting through everything. Last Wednesday I could not even see the top of Mount Gillan from my Eastside abode! 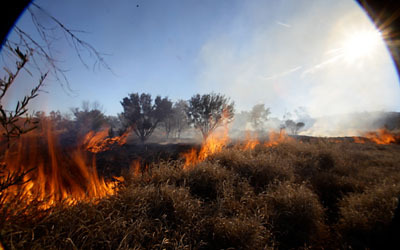 I know that burn-offs will keep the town safe and that all the plants will one day grow back healthy and strong. Nevertheless, I cannot help but wonder, how can you stay focused with all that haze? 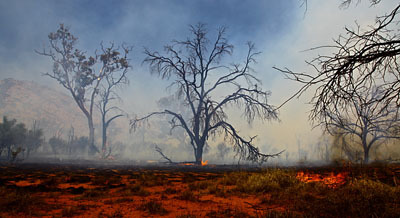 And what psychological effect is this heavy, carbon-filled air having on Alice Springs? So, how powerful do you feel, having smoke near your face when you’re at the mercy of Mother Nature? The answer: not very! Seeing what can happen and just how quickly the environment can change, and to what extent, is a powerfully startling experience. Photos by Oliver Eclipse.